Margo Anton's Mosaic a Day: "Riches"
With the exception of my pendants, this is the smallest mosaic to date. As a result, I decided I could go all out on the materials, so I covered the dang substrate in mosaic gold. 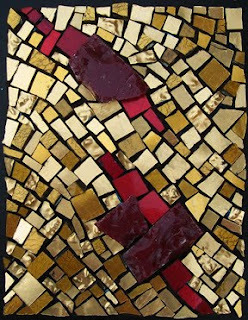 One of my personal mosaic mottos has always been: "When in doubt, add gold". Rarely do I get to play with so much gold, so this was thoroughly enjoyable.